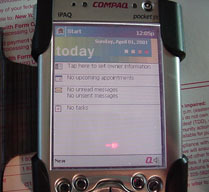 Inside iPAQ - End of the World Production, LLC. Basically the usual arrangement of screw drivers, etc. 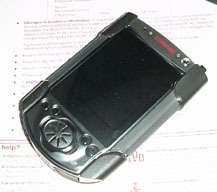 You might also notice that rubbery strap; that's to prevent my static electricity from damaging the delicate circuitry. 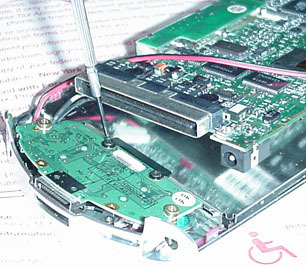 We then proceed to unscrew the 4 screws from the back. These are the only screws that are holding this thing together. The next (very hard) step is to pry the thing open. This is easier said than done. Once you get it open, the whole back comes off. 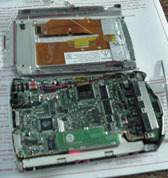 The battery is attached (glued) directly to the back panel. You can disconnect the battery (carefully). 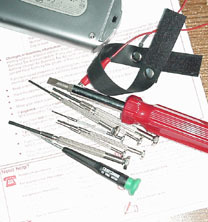 Besides for a bit of circuitry, the battery section isn't particularly interesting. 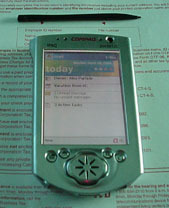 It's thin, and actually dies after about 30 minutes of use (this iPAQ is from Summer 2000 - just when they first came out). This is probably the most cramped computer I've ever seen in my whole life. It's so cramped in fact, that if that wire is not exactly where it is, the whole thing won't close! The circuit board on top there is the motherboard. 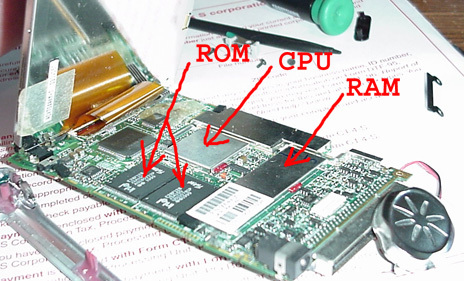 This is where the CPU, RAM, and ROM are attached (on the other side, we'll see). Because things are so cramped, there is no place for the thing to move, and thus, it has no screws attaching it to anything! 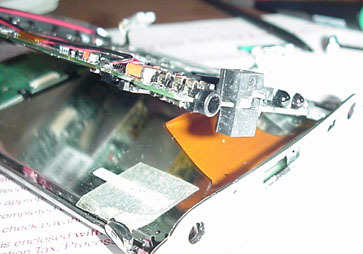 We can just lift the thing out (carefully avoiding the headphone jack, the infrared thingies, and the microphone). 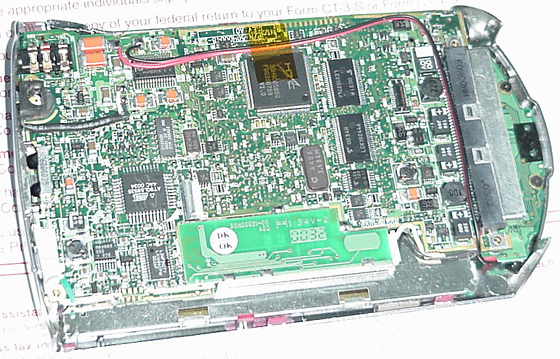 Watch out for those bright colored wires (center of pic) that connect the motherboard to the LCD screen. There are two of them, side by side. I didn't risk unplugging them (the connections look flimsy, and besides, we don't really need to unplug them to get the whole thing out). After those two screws (and removing that metal band) the whole thing (LCD and all) simply detaches from the front panel. Actually, detaches is a wrong word; more like it falls or crumbles apart. 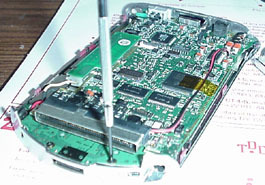 In fact, this little component is where the base station connects (for synchronization with the PC). 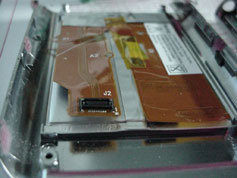 Also, there is no easy way to get inside the LCD to clear out all the dust that tends to accumulate there. The thing is sealed! I do sometimes wonder how my cat's hair seems to have gotten in there. 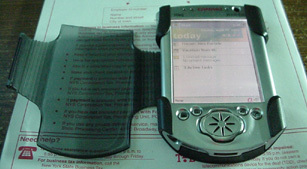 If you look closer at the iPAQ screen above, you'll notice that it starts with the default program that runs when you first buy it. 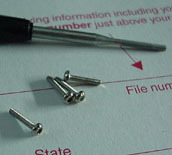 It teaches you how to use the stylus, how to select items, how to cut & paste things, etc. Obviously, all software and data are gone (besides for the bare OS).